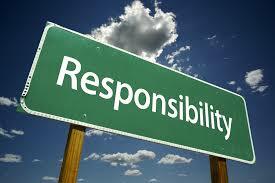 Can you harness the magic of Responsibility? Here we consider a key coaching principle of responsibility. The principle of awareness will be considered in the next posting in the series in about a fortnight’s time. …except for two weeks in every year. These were the two weeks when her boss, the senior manager was on holiday. During this period she would be responsible for managing his diary commitments, handling requests from other senior members of staff, signing purchase orders and a host of other tasks that were very, very different from her normal job. At these times she was a pleasure to work alongside and got through a staggering amount of work. What could explain the difference? It wasn’t just relief that her boss was away, because he was a genuinely nice and capable person for whom we all enjoyed working. It wasn’t because the tasks she now undertook were glamorous and fulfilling because they weren’t. It was because she was responsible and knew it. If a conflicting diary appointment occurred when the boss was there, she made him aware of it and he decided what to do. If someone wanted to raise a purchase order when he was in he decided if the money could be paid away. In his absence, she made these decisions; she was responsible she had choice. There was a chance she could have made mistakes but I cannot recall a time when she did. This is the magic of responsibility. How many times have you seen the wayward sports team member be transformed by being given the captaincy? The sports manager understands the power of responsibility and giving people choice in order to make them feel empowered. It can turn the poacher into the gamekeeper overnight. The next time you’re thinking about how cynical old Brian from accounts may react to the latest changes to the office procedures, think about what might change if Brian were to be invited to take responsibility for changing the office procedures. Notice I say invited because responsibility must be taken up; it must be accepted; it cannot be imposed. Coaching is about getting the best ‘out’ of people, which implies that it’s there to begin with, but people will only choose to give of their very best they’ feel capable of doing so, when they’re rewarded for doing so and when they’re willing to try. You can use coaching to make sure these three elements are in place or to uncover any blockages. The coaching questions in the ARROW model are designed to generate responsibility, e.g. ‘What are YOU going to do?’, ‘When are YOU going to do it? etc. It’s ok for you to put people on the spot a little bit with these sorts of questions, and we need to if we really want to improve performance at work. While we continue to do things for people that they can (and sometimes need) to do for themselves we actually have not helped at all.